By in large its been a bloody awful summer hasn’t it? I have sat in my garden exactly twice so far which makes me regret all the flowers I bought to tart it up a bit for the season. And now I read that August is set to be a wash out. Well pooh to summer – just bring on boots season and be done with it I say. At least I can take solace in the discovery of three new places to eat this summer. This is possibly my favourite discovery this summer. The Grumbling Tummy collective headed off sometime in June for a healthy walk in Tentsmuir Forest. On the way I was berating anybody who would listen about a lack of bottled water and moaning generally about our rubbish preparation. As we drew into the car park we saw that our crisis would be averted as there seemed to be a mobile food van parked up. Brilliant I thought – water and a greasy burger for after the walk. I honestly was rather excited by the prospect. 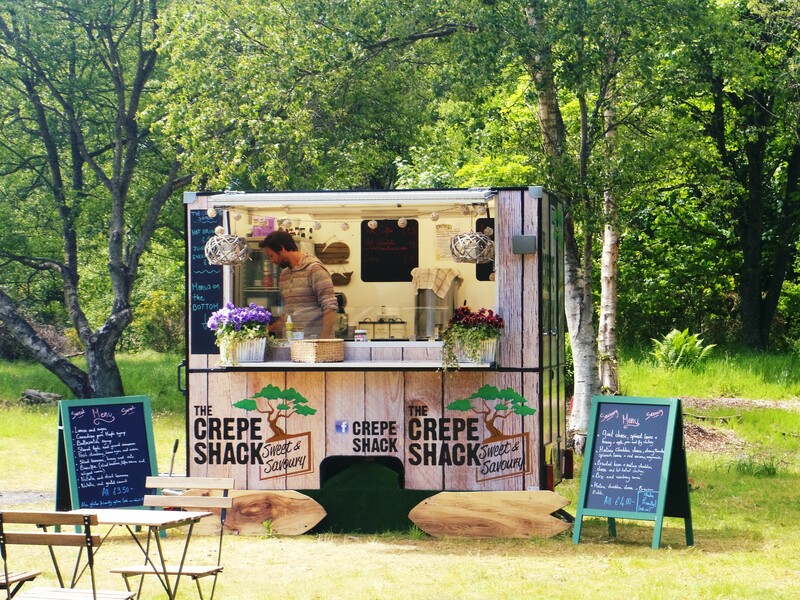 However as we drew closer I was – well quite gob smacked to see that the mobile was indeed something called the Crepe Shack. It was like an oasis – not only was it adorably shabby chic but the owners had popped a few bistro chairs and tables out in front for their patrons. More importantly the crepe shack menu was to die for. I can tell you that walk was so much easier knowing that the Crepe Shack would greet me at the end. I just about broke an ankle dashing to the shack on the way back. BUT did they taste any good? Ladies and Gents, these were the best darned crepes I have ever tasted anywhere and that includes Italy and France – so there. They were absolutely divine and as you have had a big old hike they are 100% guilt free. 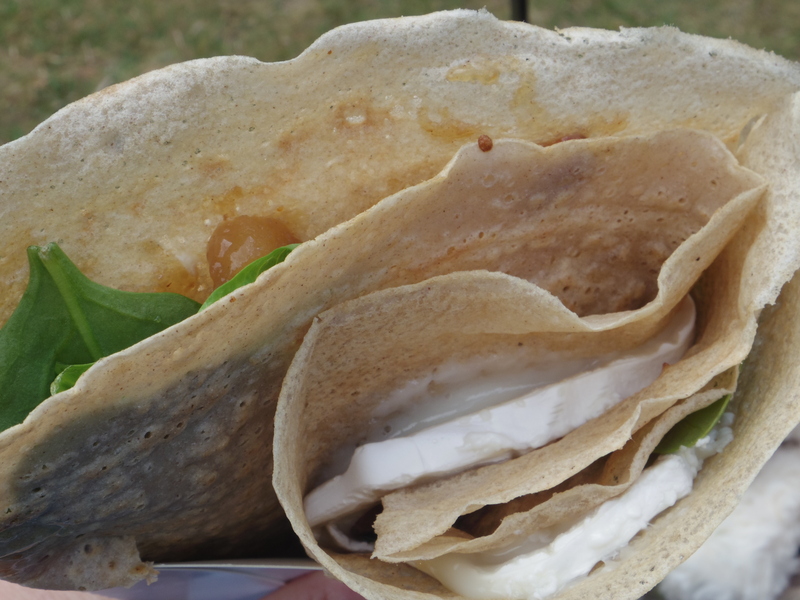 Also good to note that if you are one of those people who like me should really make an effort not to eat gluten to avoid looking permanently up the duff (maybe that is just me) then these guys make it easy with gluten free crepes on offer. My new boss over at Kidney Kids Scotland told me about this place only a few weeks ago and I have been twice now and lining up the next visit. I found it hard to believe that such a place existed in such close proximity to my home without my knowing about it. 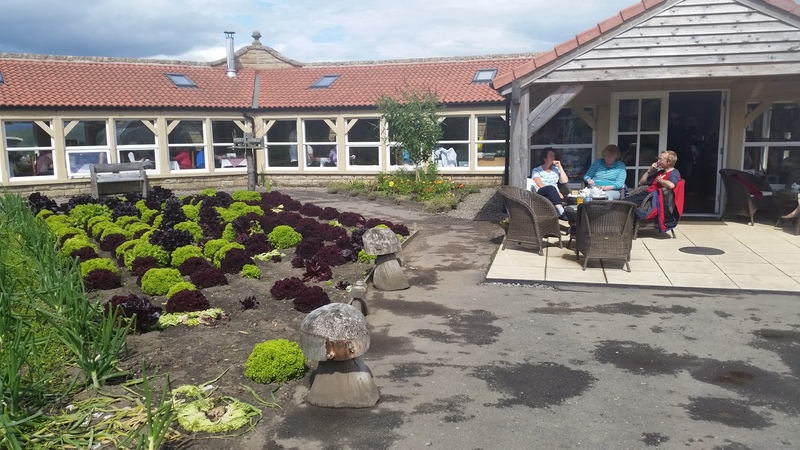 A walled garden with a fantastic cafe/restaurant and a little produce shop. Surely not! The walled garden is the brain child of Keith Laing and Anne Crawford who up until a couple of years ago had their cafe in one of the potting sheds in the grounds. Now they have an airy and stylish 70 seater cafe/restaurant that welcomes visitors with gingham table cloths, patchwork upholstery, fresh flowers and a plethora of beautiful wood. I also spotted a wood burning stove which bodes well for the winter months. The setting is stunning as is the range of cakes under shiny glass domes that greets you. 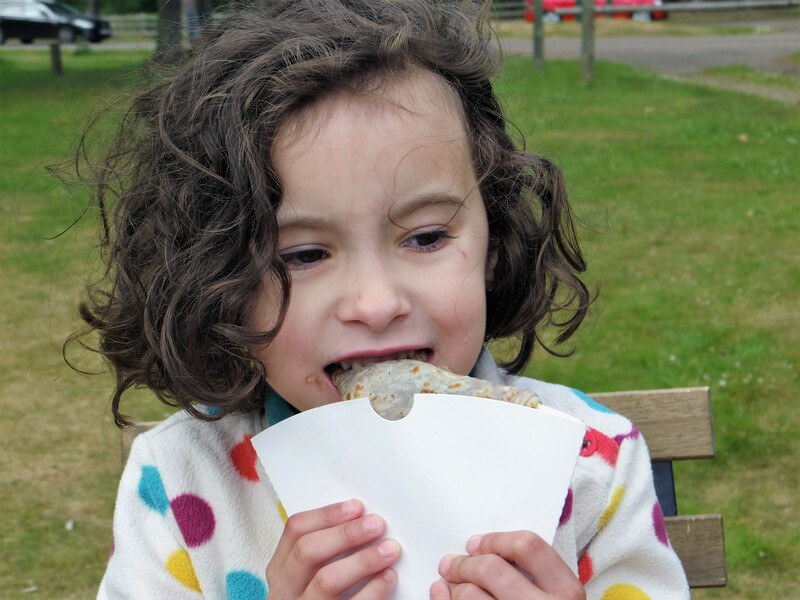 Onto the cakes later ….. The menu is fresh as fresh can be and they always seem to have a lovely range of specials. 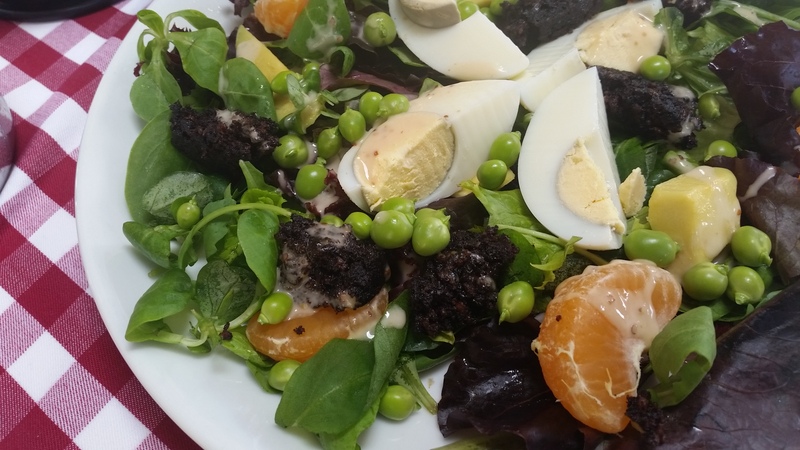 On my first visit I opted for a salad with warm black pudding and avocado. This beautifully simple little salad also included freshly podded peas which transported me back to my granny’s back step aged 9, eating more than I put into the bowl for tea. There really is nothing to beat a freshly podded pea – you can tell one a mile off. B chose a simple baked tattie with tuna, cheese and salad and as filled bakers go it was a winner. 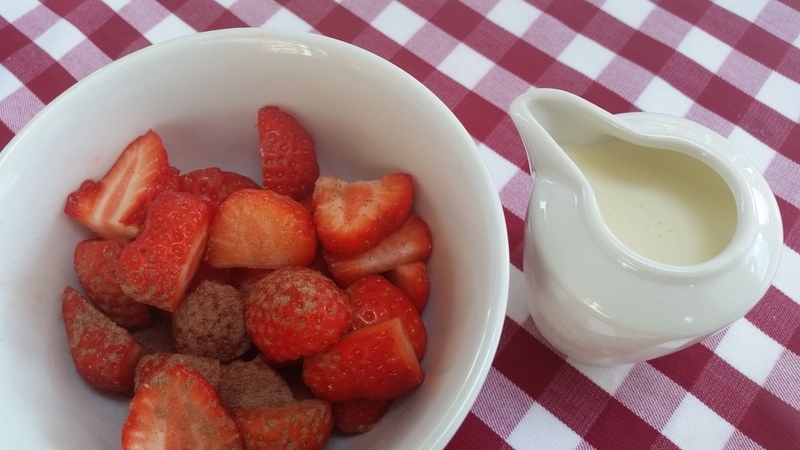 I had the delight of fresh local strawberries and cream for dessert but nearly fainted with pleasure when I tasted a little bit of wee GTs empire biscuit and a forkful of Mr GTs lemon cake. This sort of cemented my return a mere week later. This time we brought friends who were equally impressed. I chose the lemon cake on this coffee/cake venture and my companions chose chocolate cake, coffee and walnut cake and a scone with jam and cream. All cakes were delicious. My lemon cake (and this seemed to be echoed around the table) was so light and fluffy and not a bit dry. I learned that Joyce who works in the cafe pitches up early in the morning to bake all of the beautiful sponges on offer. By god that home made freshness shows – thank you Joyce. This is a brilliant hidden treasure. After a walk in Devilla forrest it is the perfect place to head for lunch or an afternoon treat. Can’t recommend the Walled Garden highly enough. 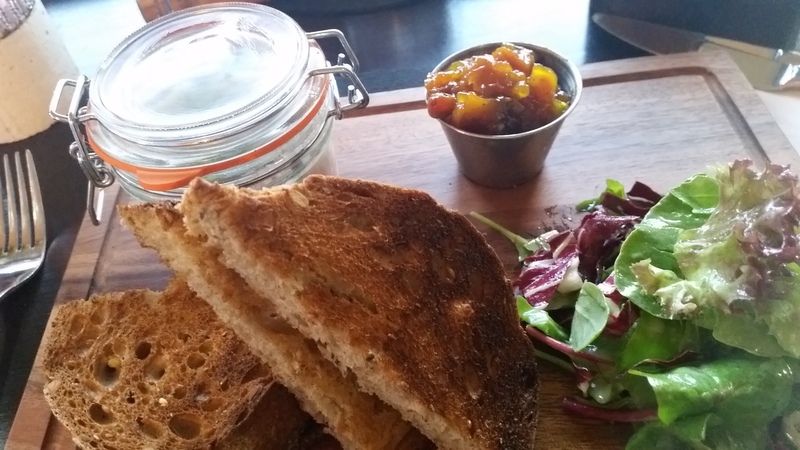 Dunfermline is has not really been known for its top class nosh in recent years so this new kid on the block has rather blown me away. This Bistro (one of the finalists in the Scottish Food and Drink awards this year) is wonderful in every way and former accountant Deborah and award winning Bib Gourmand Chef Michael are a fantastic team. Deborah, whose Rockabilly style is utterly perfect gives her diners a fantastic personal service and is extremely knowledgeable about both the food and wine. The interior is very French bistro with fantastic jazz tunes from yester-year playing in the back ground – perfect. Behind the scenes Michael has created the most marvellous French menu and the only issue for me with was deciding what to have. I literally could have eaten every single thing on the menu – though not in one sitting. How do you choose between slow cooked pork belly with butter beans, sauteed spinach and grain mustard; slow cooked beef bourguignon served on creamy mash with green beans; the blade steak special; pan fried supreme of chicken with peas a la Francais and butter carrots. There was more !! This dish was every bit as full flavoured and rich as it sounds – I could have eaten this forever. It was my first rillette but not my last. Slow cooked pork belly was always going to be the winner for me – hard to resist really. The pork belly was absolutely perfect. Still with form but falling away easily the meat was perfect and what a lovely match butter beans and spinach were with this dish. The sauce (not too much) was rich and delicious and I have no idea what might have been in this feat of genius – but that is what it was to my taste-buds. The wine was flowing and despite having two very rich meals I opted for Sticky Toffee pudding with cream. Well you simply can’t go wrong with that can you? No you certainly cannot. It was fantastic – enough said. I WAS STUFFED – all a good way but lets face it that was one rich feast. It was marvellous – great company, beautiful wine and three absolutely excellent dishes. I hope that they win their award and I hope that the bright lights of success don’t draw the team away from Fife. My third hope is that the good people of Dunfermline who spend too much of their time high tailing it over the bridge to Edinburgh try out this fantastic restaurant and realise that what they have on their door step is every bit as good as the best restaurant they can find in the capital.